Wing span: 1 1/4 - 2 1/4 inches (3.2 - 5.7 cm). Identification: Forewings are rounded. 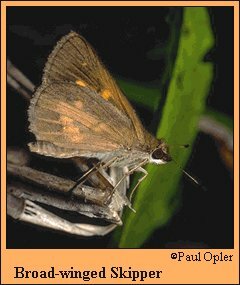 Upperside of forewing is dark brown with a small yellow-orange area and small cream spots. Hindwing is mostly orange with a black border and black veins. Underside of hindwing is orange-brown with a yellow-orange streak running from the wingbase and a median band of squarish yellow-orange spots. Life history: Males patrol through reeds or other host plant habitat with a slow, jerky flight to find females. Females lay eggs singly under the host plant leaves, which are eaten by the caterpillars. Caterpillars rest between a leaf and a stem, strengthening the area with silk before they molt. Flight: One brood from late June to early August inland; two broods from July-August along the mid-Atlantic Coast; several broods from May-August in Texas. Caterpillar hosts: Inland populations feed on hairy sedge (Carex lacustris); coastal populations feed on reed (Phragmites communis), wild rice (Zizania aquatica), and marsh millet (Zizaniopsis miliacea). Adult food: Inland populations sip nectar from swamp milkweed, purple loosestrife, and blue vervain. Coastal populations use nectar from dogbane, swamp milkweed, pickerelweed, thistles, salt marsh fleabane, and others. Habitat: Freshwater and saltwater marshes. Range: Inland populations range from the eastern Dakotas east to south Quebec and central New York. Coastal populations occur from Massachusetts south to northern Florida and west along the Gulf Coast to central Texas.